Communication with a loved one in prison can be a challenge, but it important to stay in touch with your loved one. It’s one of the most important things you can do to help them maintain their mental, emotional, and physical health. Prisoners who have strong relationships with their families through frequent, quality interaction do really well during their incarceration and also when they get home. Multiple studies have shown that family contact and communication reduces recidivism, making society safer and saving taxpayer money. In-person visits are important. A loving hug from a mother, a kiss from a child or a warm embrace from a spouse can help a prisoner cope with his environment better. According to the American Enterprise Group (AEI), prison visitation reduces recidivism by 26 percent. Recidivism is decreased when visitation is more frequent, and when extended family and friends visit who can provide inmates with a larger support network. The AEI also found that prisoners are less likely to engage in misconduct when they have the social support visitation provides. But, in-person visits can sometimes provide a challenge. If the facility where your loved one is housed is hundreds of miles away from where you live, you may have infrequent in-person visits because travel to the facility is expensive or inconvenient or both. A 2015 Prison Policy Initiative report, found that roughly 50 percent of those imprisoned less than 50 miles from home received a family visit the previous month. Only about 15 percent of those living between 501 and 1,000 miles from home received a visit the month prior. That’s not a lot of visits. If a family member is serving time in a facility that’s good distance away from home, video visitation seems like a solution by allowing you to connect with your loved one more frequently. Video visitation uses video conferencing technology to allow you to have visits with your loved one without being face-to-face. One way to do video visitation is to equip visitor areas with video visitation stations. Inmates have stations or tablets located in day rooms or cell block areas. The other way to do video visitation is to connect from the facility to a home with internet access. Either way, the inmate and their loved ones have no direct contact. Most companies charge for a set amount of time and require pre-scheduled appointments. Typically, the visitor must make an appointment and pay for the charges for the visit upfront. The inmate is alerted to be ready to receive the call at a certain place at the appointed time. The visit begins when both the visitor and inmate are on the call. Video visitation is being used to replace and not supplement in-person visits in a lot of facilities. It’s an extremely cost-effective alternative for prisons. It eliminates or reduces the number of onsite visits, which means correctional officers don’t have to spend so much time on security duties. Fewer officers are required for the visitation process. But where prison save money, video visitation will cost you money. Video calls into prison facilities are expensive and the quality is not always good. Rates for video visitation can be as high as $30 for 30 minutes depending on the carrier and the facility. The high rates for video visitation can make it impossible for loved ones to visit on a regular basis. In some facilities, inmates are punished for misconduct by having in-person visitation taken away and replaced with video visitation. This also punishes the family because it’s not simply the inmate who suffers when visits are taken away. The whole family suffers. The Prison Policy Initiative and two New York City comedians teamed up to challenge the industry’s claim that video visitation is “just like Skype” with four short videos. Here’s one video that talks about the cost of video visitation. 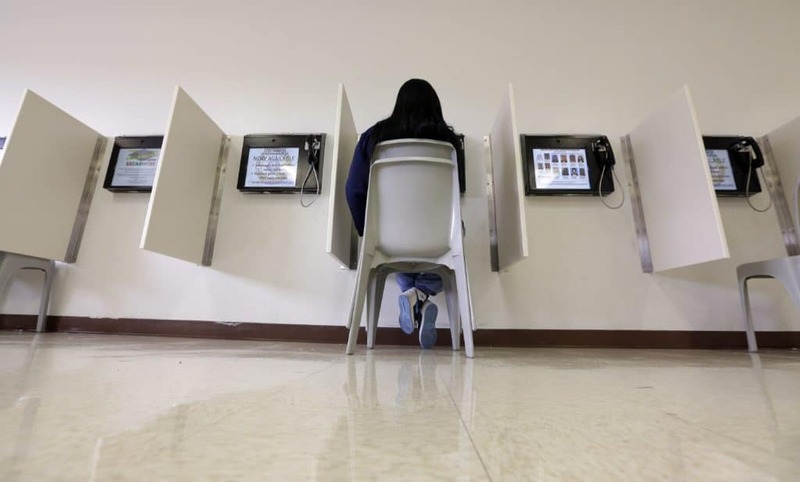 The U.S. Senate is working to pass legislation that requires the Federal Communications Commission to regulate the use of video visitation and inmate calling services in correctional facilities. This will protect inmates from the elimination of in-person visits, the high costs of calling services, and substandard video calling technologies. Thankfully, legislators are working on laws to prohibit big prison calling services from charging ridiculously high rates for video visits and prison phone calls. At PrisonConnect, we offer the option for low-cost phone calls to your loved-one. We don’t want you to have to choose between paying your bills and making a phone call to your loved one. It’s important to have a low-cost option to stay in contact with your loved one between visits. We know how hard it is and we hope that by providing low-cost phone service, you can stay connected with your loved one.